All trees and bushes in the school and apartment maps are replaced with new higher quality models. New plants: sakura trees, hazel trees, elderberry, dandelion. Sakura trees come with interactive petals falling from trees and affected by collisions. New plants added in the Shrine map (around lake): bulrush, lotus, dandelion, daisy. Fallen leaves under the sacred tree are replaced with leaves dynamically falling from the tree and affected by collisions. Fixed a small bug with menu booklet not disappearing from hands after closing it in the cafe. Fixed a small issue with hair declining angles on water slides. Fixed a small bug with gui action button not updating correctly after placing pillow on swimring. A new ride is opened in the Summer Town map – Merry-Go-Round (carousel). Like all other rides, it can give you +3 relationship points. A rocking horse is installed in the Shoujo Mart. Fixed apartment floor tiling error. Fixed a few small issues for sitting animations. More accurate detection of free space for sitting on the ground. This update is dedicated mostly to graphics improvements. Many low quality and blurry textures from early development stages of the game (mostly from “school” and “apartment” maps) are replaced with new high resolution textures. Main school building, gym, all auxiliary school buildings, all shops across the school, cafe, and apartment building are recreated from a scratch with much better quality (both 3D models and textures). Many other interior and exterior items were also completely redone with better quality, including: porches, stairs, pavements, school gates, kitchens, metro station, hand washing basins, air conditioners, various railings and poles, and numerous smaller items and decorations. Recipes: ikayaki, yakiimo, yakitori, tonjiru. Shinto shrine map has new bushes with yellow flowers. Two new hairstyles are available in the beauty salon. While sitting on a bench or bed, your girlfriend will move closer (or move away, if she is angry) to you depending on her current (daily) relationship score. Fixed a minor bug which occasionally prevented the kissing mini-game if you pushed your girlfriend several times to move her to a different position. Fixed a minor bug that prevented collision with girlfriend during hide and seek mini-game. Kissing simulation platform is moved to the Summer Town map. Selling price of squirrels is increased. All translations are updated according to the game wiki. A preview of the new water gun feature (work in progress), which will be used in the future for several special events in Shoujo City 3D. 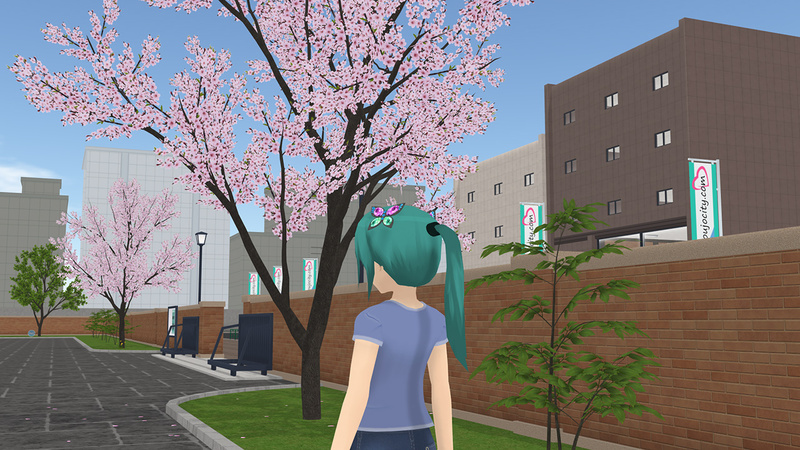 Free demo version of Shoujo City 3D for Windows and MacOS is updated to version 0.6.1 and now has all the recent additions for the school and apartment maps. Download links are in the sidebar menu on the right. All maps have small bamboo trees with Tanabata paper decorations (Tanabata is a traditional summer festival celebrated in Japan on July 7). 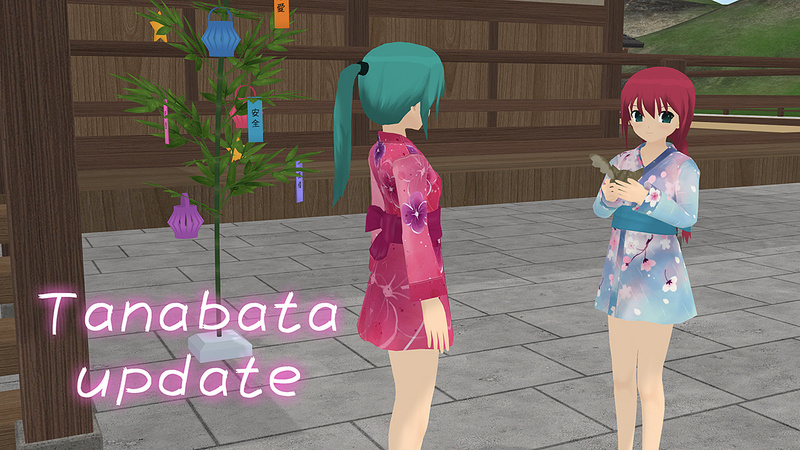 Two new yukata (summer kimono) and geta (wooden sandals) can be bought in the Shinto shrine map. The “rack b” (with computer) now has two additional slots for window and balcony door curtains. New curtains can be bought in the convenience store (2 different designs thus far). After placing them on windows you can open and close curtains by using “action” button. Computer in apartment room now can be used to read update log for the newest version of the game. Also, you can buy a new computer in the convenience store (3 different computers are available). Recipes: miso soup, asari miso soup, tsukimi udon, tsukimi soba. Girlfriend’s equipment button was moved to the main toolbar (since many people had trouble finding it). A new hair ribbon accessory (in the Fashion Store). The waitress NPC in the cafe is improved and now will actually serve the food you order, instead of it just appearing on the table. More item categories (kitchenware and most of cooked food) now can be examined in 3D mode. Optimization of textures to reduce size of game files (iOS version). Alpha 0.8.1 update of Shoujo City 3D is released on Steam and the App Store. The roller coaster ride in the Summer Town park is finished and now can be used as a dating activity. One ride will give you +3 relationship points (only once per day). If you date a pillow, you’ll have to place her in the coaster cart to start a ride. Some areas of the park were redesigned, more attractions and buildings will be added in future updates. There is also a new ferris wheel (under construction). “Summer Town” map now has music – you can turn it on and off by walking towards the music speaker (in the Kakigoori Stall) and using action button. Fixed the bug with camera collisions during the kissing mini-game. More accurate checks for detecting space where characters can sit on the ground. Fixed incorrect tiling of the floor in the gym (school map). Fixed the bug with clicking on squirrel in the smartphone camera mode. Clicking on phone button when using phone is not possible (e.g., while swimming, or riding roller coaster) now will open game quit dialogue. Free demo version of Shoujo City 3D for Windows & MacOS is updated to version 0.6 and has numerous fixes and new features, including the full playground, beauty salon, and more. Download links are in the sidebar menu on the right. School map is redesigned and now has a new playground area. You can use a swing, a seesaw, and can crawl inside the sphere. If you date a pillow, you’ll have to put your pillow on a swing/seesaw seat to use them. All ice creams are replaced with new 3D models.